Dentures have helped many individuals over the years, and they have served a valuable purpose in their ability to replace missing teeth. With that in mind, traditional dentures often have significant drawbacks, including the extra steps necessary to properly maintain them and the potential for slippage along the gums. Implant-supported dentures can offer an innovative remedy for these concerns, helping to stabilize dentures and allow them to serve as more comfortable, better-fitting artificial teeth. Here at Thompson Center for Dentistry, our dentists offer implant-supported dentures for patients looking for an alternative to traditional dentures or full sets of dental implants. This procedure can improve both the look and function of the teeth without some of the less desirable effects that can be caused by traditional dentures. Implant-supported dentures are missing teeth replacement options that utilize dental implants combined with a customized denture appliance to provide results that feel and function more like original teeth. Also commonly referred to as “implant dentures” or “implant-anchored dentures,” this treatment can be ideal for patients who are missing several teeth or all of their teeth. 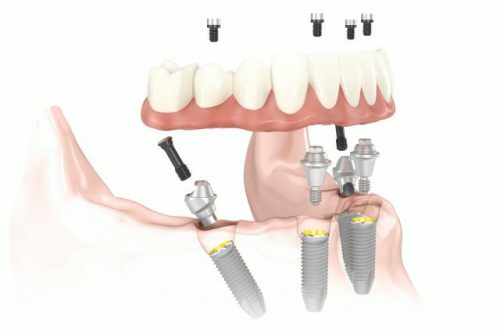 It requires only a select number of precisely placed implants, rather than a dental implant for each missing tooth, to yield effective results. Dr. Uyen Thompson offers a fully comprehensive selection of restorative dentistry procedures here at our practice; therefore, there are a number of effective implant denture options to choose from. During your initial evaluation and consultation, Dr. Thompson can explain the benefits of each type of implant denture available and help you determine the best treatment for your needs. All-on-4® implant dentures require just four dental implants on each arch of the mouth to support a full denture appliance. This state-of-the-art implant denture technique can be very beneficial for patients who are missing all of their teeth on the upper and/or lower dental arches. For many individuals, All-on-4® procedures can be performed in a single day here at our practice. Learn more about All-on-4® Teeth in a Day. The All-on-6 implant denture treatment utilizes the same concept as All-on-4®, only with six implants on each arch instead of four. Due to inadequate bone quality in the jaws and other potential concerns, some patients may need six implants to provide a solid enough foundation for the denture appliance. This can increase the chances that the denture will be as secure and comfortable as possible. Once Dr. Thompson has examined your oral structures and taken detailed x-rays, she will be able to determine whether the All-on-4® or All-on-6 technique is more ideal. Implant dentures can be exceptional options for patients who require a full mouth reconstruction. This procedure involves a complete dental restoration for patients who are missing most or all of their teeth. Learn more about full mouth reconstruction. What does the implant dentures procedure involve? During your initial consultation, our cosmetic dentist will perform a comprehensive evaluation to determine whether implant-supported dentures are right for your needs. In some cases, patients who have been told they are not candidates for dental implants may be eligible for implant-supported dentures, depending on the location of the missing teeth, jawbone density, and other factors. If you are a candidate for implant-supported dentures, our dentist will create a customized treatment plan designed to provide you with the best possible results. 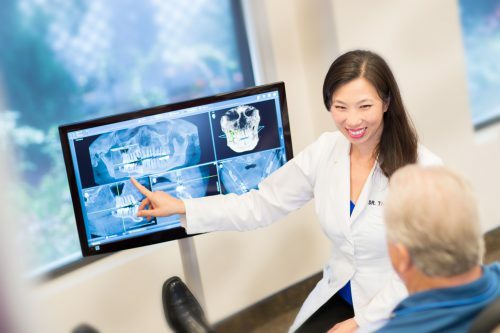 We will utilize advanced digital impression technology to take a precise image of your oral structures and determine the most accurate placement for the dental implants. The implants will then be placed in the areas of missing teeth and, once they have adequately fused to the jawbone, the denture appliance will be securely fastened to them. It will take a few months for the implants to fuse to the bone; however, temporary appliances can be worn during this period. The dental implants are designed to become a permanent fixture in your mouth, much like a natural tooth root. Implant-supported dentures allow you to have a new set of teeth that both look and feel more like natural teeth. In most cases, they can even be cleaned and maintained using normal daily oral hygiene habits, and they will not require gummy adhesives to provide a comfortable and precise fit. It is important to note that our practice accepts a comprehensive array of payment methods to make this treatment as financially convenient as possible. During your initial consultation, a friendly member of our dental team will produce an estimate of the total cost, including all expenses associated with the procedure, and talk with you about payment options that will be best for your budget. If you would like to learn more about implant-supported dentures and the many options for natural-looking teeth replacement available here at Thompson Center for Dentistry, please contact our office today.